Is Obama a Jihadist Vegetarian? Obama aides sharply disputed the initial stories suggesting that he was a Muslim, and in Iowa, the campaign keeps a letter at its offices, signed by five members of the local clergy, vouching for the candidate's Christian faith. Nowhere in the article, featured on page A1, does Bacon point out that there is no factual foundation to the rumors. Would it have been so difficult to report that the rumors are simply wrong? Would it have been so difficult to say that the word rumors is simply a euphemism for lies? Obama recounts how he became a committed Christian in his memoirs. He has attended the same church, Trinity United Church of Christ, for most of his adult life. It seems to me that if a person attends church week after week, year after year, the question ought to be settled. Obama should no more have to deny he's a Muslim than Mitt Romney should have to deny he's a Rastafarian. Most children of Hispanic immigrants in the United States learn to speak English well by the time they are adults, even though three-quarters of their parents speak mainly Spanish and do not have a command of English, according to a report released yesterday by the Pew Hispanic Center in Washington. 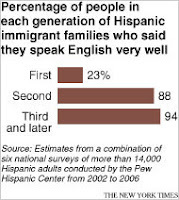 So Spanish speaking immigrants are behaving no differently than previous generations of immigrants who spoke Dutch, Swedish, German, Italian, Polish, Russian, French, Greek, Yiddish, Hindi, Chinese, Japanese, Vietnamese, Portuguese, Persian, Ukrainian etc. As for legislating English as the official language of the U.S., there is little reason to enact laws to require people to do what they already doing. Alan Coffey, who writes The Digital Federalist, highlights this design for an enormous wind turbine being built in China. Here’s how it works: the vertically oriented blades of the wind turbine are suspended in the air above the base of the machine, replacing the need for ball bearings. The turbine uses “full-permanent” magnets, not electromagnets — therefore, it does not require electricty to run. The full-permanent magnet system employs neodymium (“rare earth”) magnets and there is no energy loss through friction. This also helps reduce maintenance costs and increases the lifespan of the generator. Extravagant claims indeed. One of these monsters would provide more than the power needs of Delaware. So could one work for Delaware? It's unlikely. 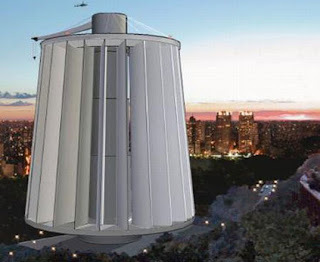 This new wind turbine don't appear to be designed for offshore wind power, and thus would be best suited for the wind swept prairies of Texas, for instance. Connecting one to the grid would be a challenge. Each of these would have to be matched to a sufficiently large load to make engineering and economic sense and be matched by other energy sources. So for those who advise passing on the proposed offshore wind farm for Delaware and waiting for the next big thing, this is it—and it wouldn't fit here. These behemoths could be more easily attached to the grid in China, which is growing by more than 12 million residents a year. To accommodate these millions, China has embarked on a program to build entirely new cities from scratch every year. Let's start with the idea that globalization makes it impossible for American workers to earn good wages. The facts say otherwise. All of the world's advanced nations have to compete in the same global economy. Yet America's combination, of soaring incomes at the top and stagnant wages for most workers, is unique. If globalization isn't the reason for growing income gap between working families and the very wealthy, then what is? Good question. If global economic forces aren't to blame, then factors peculiar to the U.S. must be involved. I would think that possible causes include tax laws that favor the accumulation of extreme wealth, weak labor laws and and corporate governance practices that drive executive pay ever higher. There are many ironies in today's photo op of Al Gore and other U.S. Nobel laureates in the Oval Office. News stories about the meeting tend to mention the disputed Florida recount. 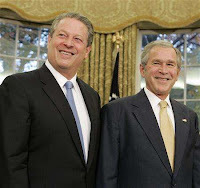 But perhaps more poignant is the faded memory of candidate George W. Bush talking about reducing carbon emissions in the 2000 campaign, a move clearly designed to blur the differences between the two on environmental issues. With the help of Congress, environmental groups and industry, we will require all power plants to meet clean air standards in order to reduce emissions of sulfur dioxide, nitrogen oxide, mercury and carbon dioxide within a reasonable period of time. It took Bush only 54 days after taking office to repudiate that promise, and another 2,267 days after that to publicly acknowledge that reducing carbon emissions might make sense after all. Madam Chair, Commissioners, and agency representatives, thank you for the opportunity to appear before you today to speak on behalf of Delaware’s and our planet’s energy future. I have dedicated the better half of my career to protecting our global environment and to the extent that I have been successful, I consider that my legacy. We Delawareans can take pride in the contribution we have made, such as the law to protect Delaware’s coastal areas from destructive impacts of heavy industrialization and offshore loading facilities. We fought off the naysayers then and made a commitment to protect our natural heritage for future generations, and have reaped the benefits ever since. The decisions you four agencies now make in shaping Delaware’s energy future will be part of your legacy, and Delaware’s legacy. Now is the time for Delaware to face up to the serious threat of global warming by embracing a form of electric generation that does not use the fossil fuels that cause it. You have the opportunity to make Delaware the first state in the nation to generate clean energy from an offshore wind park. The wind is a free fuel – it transports itself – it doesn’t cause global warming – it does not, like the fossil fuels, emit effluents that poison us – it promises electricity at a stable price – it will not be subject to the carbon tax that will very likely and appropriately be applied to fossil fuels – and the technology for using the wind has been well established. So, why not use it? The large investment in building and installing the wind turbines and transmission lines is high, and will result in a small premium for the electricity produced. The consultant’s report estimates about $1.60 per week for an average size house, the price of one half-gallon of gasoline. When a carbon tax is eventually applied to fossil fuels, the premium for wind will be much lower. You four state agencies earlier blessed the Bluewater Wind proposal and asked Delmarva to negotiate with them. These negotiations have been less than successful. Delmarva Power has wildly exaggerated the premium for wind. She needs to get away from her love affair with fossil fuels and provide some leadership toward reducing the super-serious threat of global warming. I encourage you to do all you can to find common ground here. A wave of concern about global warming and of resolve to do something about it is now growing and spreading all over the world. Just this past weekend the United Nations Intergovernmental Panel on Climate Change with members from 130 nations reported the results of their latest study. 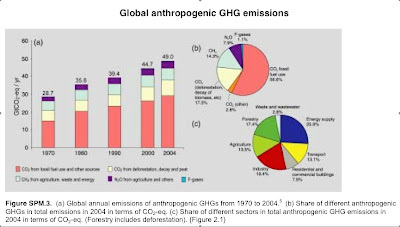 It showed that emissions of greenhouse gasses worldwide was increasing faster than predicted, and making global warming more dangerous than the worst case previously envisioned. The U.N. Secretary General, in releasing the report said, "Climate change is the defining challenge of our age," and called upon the United States to "play a more constructive role." You and I need to take this problem more seriously. The Nobel Peace Prize Committee showed their concern recently by awarding their Peace Prize to the U.N. panel and to Al Gore for their work in enlightening the world to the threat of climate change. Our own University of Delaware Professor John Byrne is a prominent member of that panel. We can now recognize him as a Nobel Laureate. More and more countries, states, cities, corporations, churches, and synagogues are becoming involved. The news media have made it a prime subject. The New York Times on Nov. 7 of this year had a twelve-page Special Section on the "Business of Green." Absent significant action by the Bush Administration, state governors are taking over creating regional agreements to cap greenhouse gas emissions. Governor Brian Schweitzer of Montana told a group of Midwestern governors that dealing with global warming was the greatest imperative of this and future generations. "We need to find a sustainable, renewable American supply," he said. We have much to be thankful for. 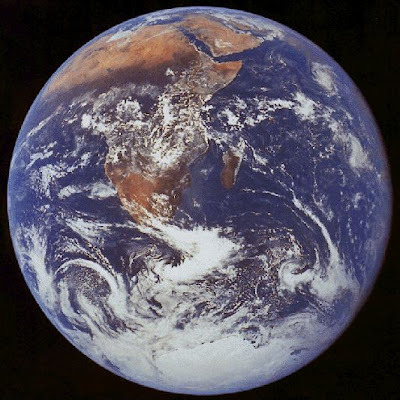 I believe we are called upon to show our gratitude by taking care of the earth. November 21, 2007 Delmarva and Bluewater circulate the working draft PPA to Staff. November 26, 2007 Delmarva and Bluewater provide Staff with an issue sheet outlining all outstanding issues remaining in the PPA negotiations, as well as each party’s position regarding each unresolved issue. November 30, 2007 Delmarva files draft PPAs for back-up suppliers with the State Agencies. December 10, 2007 Delmarva circulates the final Delmarva-Bluewater PPA that resolves all outstanding disputed issues to the State Agencies. December 18, 2007 State Agencies to consider the final Delmarva-Bluewater PPA for the provision of offshore wind power. As for what it means, I'll provide you with some exegesis in the next few days. That comes to 1,000 posts in 1,000 days, and no I didn't plan it that way. My heartfelt thanks to all my readers. Keep coming back. In the meanwhile, I'm off to Dover for the PSC meeting. I'll let you know what happens. If Mike Mahaffie takes note of the odometer rolling over on his Prius, I can do the same on my blog: This is post number 999 on TommyWonk. I started TommyWonk on Wednesday, February 23, 2005 (not that anyone was paying attention), and got started in earnest in March. The Delaware blogosphere was smaller then. Hube was around, as was Sneaking Supsicions. Dana started Delaware Watch in March, and Jack Markel started blogging then as well. Dana and Jack were the first two bloggers to link to me. Since then the blogoshere has expanded considerably, and what started for me as a solitary endeavor has become a link to new friends and a connection to people who not long ago hardly know what blogs were. It is becoming increasingly common for Delaware's bloggers to appear on radio, local television and in newspapers. Why? Because after listening to the old hands say the same old things year after year, people are interested in hearing fresh perspectives on the events and issues of the day. Because people are discovering that the best bloggers have something interesting to say and say it rather well. For more fresh perspectives, you might want to check out these recent additions to my blogroll: The Delaware Curmudgeon by Shirley Vandever, The Soapbox by Mat Marshal, Delaware Libertarian by Steve Newton and Daily Delaware by the Kossack known as Delaware Dem. We're for renewable energy, just not here and now. Not here means not here in Delaware. Not now means let's scrap the RFP negotiations and start the whole process over without the requirement that Delmarva actually make a long term commitment to buy renewable energy. If you're looking for some heavier reading, kavips has a good and rather lengthy summary of the report from Bluewater's consultant, including no fewer than 13 charts and tables from the report. The report itself along with other filings and several thousand letters can be found at the PSC's website. Jim Black of the Clean Air Council tells me that he delivered 1,854 letters to the Public Service Commission (PSC) yesterday. WHYY's Delaware Tonight has a film clip of him handing over a heavy stack of paper to the PSC staff. So many people have sent in substantive, thoughtful letters and emails on wind power that I find myself overwhelmed. I can hardly express what this outpouring of support for wind means except to say that PSC Chair Arnetta McRae and other state officials involved in this process have repeatedly mentioned that they have taken note of the unprecedented public interest in this issue. The correspondence on wind power is notable, and not just in terms of numbers. Knowledgeable advocates like Pat Gearity, John Austin, Bill and Kit Zak, Kim Furtado, Joan Deaver, Marc Weiss, Nancy Sedmak-Weiss, Allan Muller, Ellen Lebowitz, and Delaware ACORN (this is not a complete list) have made substantive contributions to the case for wind power. Elected officials like John Kowalko, Jack Markell, John Carney, Matt Denn and my city councilman, Cam Hay have offered thoughtful comments in favor of keeping the negotiations going. Jeremy Firestone and Willet Kempton have done terrific work making the case for, and refuting the case against, wind power. It will probably take the PSC several days just to get all of these comments up on its website. Delaware Watch, Delaware Way, Delawareliberal, First State Politics and kavips have posted many of these submissions as well as their own comments. Taken together, the analyses and the letters have made a powerful case that the overwhelming public sentiment in favor of wind power is based not just on environmental considerations, but on a sound understanding of our long term economic interest. Thank you all. I am writing to urge the PSC and other agencies to do all in your power to see to it that the negotiations between Delmarva Power and Bluewater Wind continue until a successful conclusion has been achieved. The environmental and health benefits of wind power are self evident. We in Delaware are particularly vulnerable to the potential effects of climate change and need to act to ameliorate the effects in order prevent rising sea levels. Our citizens need relief from continuing toxic emissions from burning fossil fuels. The economic benefits of a long term Power Purchase Agreement are disputed and deserve careful review. We need the long term price stability, mandated by EURCSA, that a wind farm could provide as part of our energy portfolio. The criticisms that we can't afford the Bluewater proposal do not hold up under close scrutiny. This assertion that we can't afford wind power is based on the crucial and fatally flawed assumption that fossil fuel prices will not rise significantly over the next thirty years. 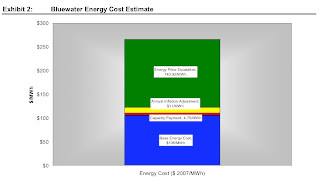 The energy price projections presented by the federal Energy Information Administration (EIA), and used in the analysis of the energy options on the table, are not credible. The EIA projects that natural gas prices will remain flat in today's dollars for the next 20 years. It is worth noting that the EIA made essentially the same prediction ten years ago. Instead natural gas prices tripled. The Independent Consultant's analysis does not present the full price risk we are likely to face in the next 30 years. The International Energy Agency (IEA), in its World Energy Outlook, projects that overall energy demand will increase by 55 percent by the year 2030 (www.worldenergyoutlook.org/). The IEA projects that demand for natural gas will match overall energy demand, and that demand for coal power will increase 73 percent by 2030. At the same time, the need for carbon emission controls will increase the cost of coal power by at least 20 percent, according to an MIT study ("The Future of Coal," p. 30, http://web.mit.edu/coal/). Taken together, increased demand, limited supply and the need for further controls on carbon emissions can only mean sharply higher prices. As for buying renewable energy on the market, it seems increasingly likely that supply could lag demand for the foreseeable future. Delaware isn't the only state to adopt renewable energy portfolio standards. Delaware's portfolio standard calls for penalties if Delmarva fails to meet the standard. If we don't act, we could either pay that penalty or be forced to pay a premium for scarce renewable energy. Those who argue against a long term agreement to provide wind power to Delaware claim we can't afford the risk. But the term sheet now on the table does not present us as ratepayers with additional risk. Instead it presents us with the opportunity to add a significant measure of price stability to our energy portfolio. If we are to take advantage of this opportunity, we must insist on vigorous negotiations in order to create the best terms for ratepayers. The PSC staff performed a public service by identifying the risk involved in proposed construction cost escalators. In turn, Bluewater Wind responded by taking this risk off the table. Negotiations work when both sides are engaged in testing assumptions and performing what-if analyses to ensure the best possible deal is achieved. I see this example as a compelling argument for continuing negotiations, and further, for encouraging our state agencies to take a more active hand in ensuring a positive outcome. Exhibit 2 demonstrates that even if the escalators were removed the SOS customer is bearing potentially $143.92/MWhr in credit risk. Contractually, the Bluewater risk profile cannot be changed by elimination of the pricing escalator language which would only shift the escalator price risk into other types of risk, which may not be capable of being hedged. By removing the pricing escalators the SOS customer, through Delmarva, would need to hedge Bluewater credit exposure through the use of Credit Default protection. First, the exhibit doesn't demonstrate anything; it just presents a result. How that result is achieved is, as Jeremy Firestone dryly observed, "not particularly clear." Bluewater takes the commodity price risk off the table, but through some act of financial prestidigitation, it remains on the table, and can be quantified: $143.92/MWhr. How did a commodity risk transform itself into a credit default risk, and one that can be measured so precisely? According to the PACE report, Delmarva is going to arrange for us as ratepayers to take out "Credit Default protection" for Bluewater Wind and its parent company, Babcock & Brown. And the report already includes a calculation of the cost of that risk price down to the penny: 14.392 cents per KWh to hedge Bluewater's credit exposure. But isn't that what investors are for? Aren't rational investors expected to recognize and account for credit risks? Such risks are generally valued by through mechanisms such as credit ratings and by buyers and sellers in investment markets. Yet the PACE report is unclear as to the mechanism by which ratepayers would take on credit risk, and offers no specifics as to how this risk might be determined by the market, let alone calculated to five decimal places. This murky analysis is central to the report's assertion that we can't afford wind power. While the assertion that we as ratepayers somehow would take on credit default risk on behalf of Bluewater's investors may be murky, the risk we face of continually climbing energy prices is all too evident. The proposed PPA with Bluewater would satisfy EURCSA's crucial requirement of price stability by locking in a source of renewable energy with a fixed price for 25 years. No alternative suggested by Delmarva would meet the objective of creating a Delaware based source of renewable energy and provide the price stability called for by EURCSA. Those who oppose the wind power proposal would in effect be making an enormous bet on our behalf—a bet using our money. They are betting that fossil fuel prices will remain flat for the next thirty years. It's a bad bet. We are holding a potentially winning hand. We must not allow opponents of wind power to force us to fold that winning hand and lose the chance to bring a measure of price stability to our electricity bills for years to come. Marian Peleski and Dana Garrett of Delaware Watch have invited me on this evening's edition of Progressive Voices, which airs tonight and every Monday night at 7:30 to 8:00 on WVUD, 91.3 FM. (You can listen online here.) The topic is of course wind power. I'll try to bring some light to an increasingly heated topic. When I encounter something I can't immediately understand, I have learned to slow down and read it slowly, one sentence at a time. This is what I did with the PACE report mentioned below. PACE Global Energy Resources was hired by Delmarva Power to analyze the cost to consumers of Bluewater Wind's revised term sheet submitted last week to the Public Service Commission (PSC). "By removing the pricing escalators the SOS customer, through Delmarva, would need to hedge Bluewater credit exposure through the use of Credit Default protection." "By removing the pricing escalators the SOS customer..."
Did the SOS (Standard Offer Service) customer remove the pricing escalators? I thought Bluewater did. For that matter, I didn't realize that we, as SOS customers, had been given a seat at the negotiating table. Perhaps I had overlooked the meeting notice sent in my bill along with the invitation to donate to the Good Neighbor Fund. "...the SOS customer, through Delmarva, would need to hedge Bluewater credit exposure..."
"...the SOS customer, through Delmarva, would need to hedge Bluewater credit exposure through the use of Credit Default protection." Now I know I have to look at my bill more carefully. Apparently Delmarva is going to arrange for me to take out "Credit Default protection" for Bluewater Wind and its parent company, Babcock & Brown. And Delmarva has already calculated the price down to the penny: $143.92/MWhr. That's 14.392 cents per KWh. But wait a minute. What if I don't want to hedge Bluewater's credit exposure? Isn't that what investors are for? Now it may be that I'm just dense, and don't know enough about finance to understand what just happened. It could be that the PACE report was written in a hurry and could benefit from some editing. It could be that sloppy writing reflects sloppy thinking. Or it could be that I couldn't make sense of this sentence because it just doesn't make sense. Delmarva's Consultant Report "Not Particularly Transparent"
PACE's report identifies a higher "green premium" than the one outlined in a Public Service Commission staff report last month, which suggested the wind farm alone would cost the average ratepayer $11.71 per month over market. The difference is largely because the PACE report projects a lower price for buying traditional electricity off the grid, said Greg Adams, who co-wrote the report for PACE. This of course is the heart of the matter: What will we be paying for electricity from current sources over the next 30 years? On this subject, the PACE report and other analyses that find offshore wind too expensive tend to underestimate future energy costs. University of Delaware researcher Jeremy Firestone said the report also assumes Delmarva Power would be buying more electricity from Bluewater than the PSC staff report identified. That would boost the price, he said. He called the report "not particularly transparent." Removing price escalators without strong credit protections imposes severe rate instability upon the SOS customer, as Bluewater is carrying risk far above its capacity, and potentially well in excess of its base energy cost. Is Bluewater in over its head? As we know, Bluewater recently sold a majority stake to the global energy firm Babcock & Brown, which manages $52 billion in assets. The capital needed to build the proposed wind farm represents no more than 3 percent of the assets Babcock & Brown manages. The firm has a structured finance unit, which means it has the expertise to hedge some of the commodity risk. Further, a firm of its size should be able to raise the capital for the offshore wind project without having to shoulder the risk premium Bluewater would have to pay if it sought investors as a stand alone enterprise. Now if I were to invest in Babcock & Brown, I would recognize that I am taking on a credit risk. But I don't see how I am taking on a credit risk as a ratepayer. There you have it. The Bluewater proposal includes this big extra cost of $143.92/MWhr. It's not there in the term sheet. But Delmarva's consultant says it's still there. The dead hand is quicker than the eye. Unlike past oil shocks, which were caused by sudden interruptions in exports from the Middle East, this time prices have been rising steadily as demand for gasoline grows in developed countries, as hundreds of millions of Chinese and Indians climb out of poverty and as other developing economies grow at a sizzling pace. “This is the world’s first demand-led energy shock,” said Lawrence Goldstein, an economist at the Energy Policy Research Foundation of Washington. Permanently higher prices will not be confined to oil. The International Energy Agency (IEA) has released its World Energy Outlook, which projects that overall energy demand will increase by 55 percent by the year 2030. The IEA projects that demand for coal power will increase 73 percent by 2030. A fixed supply and growing demand adds up to sharply higher coal prices, which will be driven even higher by the cost of carbon emission controls. The Public Service Commission and three other state agencies overseeing the wind power negotiations will meet on November 20 to decide whether to continue the negotiations between Bluewater Wind and Delmarva Power. They have set a revised deadline of Tuesday, November 13 at 4:00 p.m. for public comments. The proposed offshore wind power project would produce 13 percent of Delaware’s electricity. This energy would be clean, safe, independent, non-polluting, non-greenhouse gas emitting, economically stable and cost-efficient over the long-term. Generating offshore wind energy will help prevent the tragedy of global warming and keep our coastal areas from being flooded and destroyed. It is estimated that the offshore wind power project would save Delaware citizens $750 million on health care costs currently caused by air pollution from burning fossils fuels. An enormous hurdle was cleared when Bluewater decided to pull construction material cost escalators off the table, removing the most significant objection to the project. Wind power would bring a measure of price stability to our electric bills over the next thirty years, when we can expect fossil fuel prices to continue to climb. State regulators have repeatedly said they have listened to and taken note of public comments on this issue. They’re listening; we need to speak up. Allan Loudell of WDEL, 1150 AM, will be bringing us some news on wind power this evening. At the top of the 4 o'clock hour, he will interview Jim Lanard from Bluewater Wind about the company's decision to drop the construction escalator from its term sheet. State Rep. John Kowalko will offer his thoughts at 4:24. I will come on at 5:24. This is an important development. Last week State Sen. Harris McDowell characterized the PSC staff report, particularly its criticism of the escalator, as a "nail in the coffin." Maybe he'll have to pull that nail back out. Leading the way on these final negotiations, Bluewater proposes to eliminate the escalators from Term Sheet, thereby addressing a primary concnern expressed by the PSC Staff and Independent Consultant ("IC"). State officials have repeatedly remarked that public comments have played, and will continue to play, an important role in their decisions. I will post contact information for all of the agencies tomorrow. In a move with direct significance for the mid-Atlantic, the U.S. Interior Department on Monday released its final proposal for regulating offshore wind turbines and other "alternative" energy projects in federally controlled waters. Although work on detailed regulations will continue into next year, the agency plans to take applications during the next 60 days for permits to conduct offshore research on wind or other unconventional energy around the nation's Outer Continental Shelf. Interestingly, an extremely well-informed Dartmouth undergrad in my seminar on Sunday displayed a thorough understanding of the lack of procedures for review of offshore wind farms in federal waters. He mentioned that Mike Castle had inserted a few lines into the pending House energy bill requiring the Interior Department to figure this out. I have learned from my time in government that it's very hard to get the federal government to make a decision in the absence of precedent. So this looks like a positive sign. Bluewater spokesman Jim Lanard said there will be a tremendous demand in area states to buy renewable energy credits, but not nearly enough utility-size renewable energy plants to supply those credits. There's nowhere else to put such a project in Delaware, he said. [Delmarva Power president Gary] Stockbridge repeated a common Delmarva argument: that the company could buy onshore power from Pennsylvania at a much lower cost. But when an audience member asked Stockbridge whether Pennsylvania would be able to supply enough onshore wind power to fulfill Delmarva's state requirement, Stockbridge said he didn't know. Delmarva hasn't posed the question to Pennsylvania onshore wind energy providers, Stockbridge said. I am continually struck by the sophistication of my fellow citizens in discussing our energy future. The more people do their homework on this, the better able we will be to have an impact on this decision. I'm back home after a busy weekend talking about, what else, wind power. Saturday's rally in Rehoboth was a success in several respects. It was inspiring to join a hundred hardy citizens, including an enthusiastic cadre of kids, willing to endure blustery winds for an hour to show their support for wind power. I got to meet with the Sussex County environmental leaders, including John Austin, Joan Deaver, Kim Furtado, Pat Gearity and Kit Zak. I met Marc Weiss and Nancy Sedmak-Weiss, who recently settled in Rehoboth from Washington D.C., and organized the rally in just a week as part of a national effort called StepItUp2007. You can read more about the rally at the WGMD blog and the Delaware page at the StepItUp website. Most importantly, the rally wasn't a one time event; all of the people will be meeting regularly to plan strategy and tactics. On Sunday I spoke a a seminar that Marc and Nancy set up as part of the enormous PowerShift conference at the University of Maryland. 5,500 students attended the conference; eight joined our little session in a basement classroom. But what a group! One student from Dartmouth had done more homework on the federal regulatory hurdles to offshore wind than just about anybody. These students were interested in more than easy slogans; we discussed the policy, politics, economics and environmental impact of wind power for ninety minutes. Back home, there's plenty going on. Aaron Nathan's article in yesterday's News Journal was encouraging, and not just because he included my comment on how Bluewater could hedge its materials costs. Bluewater Wind is seeking ways to address the problems identified in the Public Service Commission staff report. John Carney and Jack Markell have both spoken in favor of letting the negotiations continue. In particular, Carney's comment can be taken as an encouraging sign that the state agencies aren't about to pull the plug on negotiations. The 7 & 40 Alliance has invited representatives from Bluewater Wind and Delmarva Power to talk tonight at the Bear Library. Nancy Willing has more on what should be an interesting evening. I took part in a great rally in favor of wind power yesterday. The gathering of about 100 hardy souls stood firm in the face of a stiff wind from the NNE at about 20 to 30 miles per hour. I'm told the organizers collected several hundred signature on letters and petitions. I should offer special thanks to Marc Weiss and Nancy Sednak-Weiss for pulling this together in a few days. Maria Evans of WGMD wrote it up on the station's blog, even providing the names and e-mails of the heads of the four state agencies who will decide whether the negotiations will continue. It was great to be able to meet with Sussex County's cadre of environmental leaders. I'll have more to say about the weekend when I get home and can catch my breath. With Delaware Solid Waste Authority's (DSWA) new “single-stream” recycling customers put all their recyclables – newspapers, magazines, phonebooks, junk mail, corrugated cardboard, chipboard, plastic grocery bags, narrow neck plastic bottles, steel, aluminum and glass – into a single 65-gallon rolling bin provided by DSWA, for weekly curbside pickup. DSWA began changing to the new program in October. It will replace the current system of multiple bags and bins countywide by December and for all of its 6,000 Delaware customers next Spring. Single-stream recycling makes sense in a lot of ways – from ease of customer use to environmental benefits, but to really make a case for it, you have to show it makes good economic sense, according to Tom Noyes. Noyes, a Trolley Square resident who has a background in finance and public policy, has been interested in environmental issues for years, so when some friends were named to a citizen task force on statewide recycling last year, he offered to do some economic modeling for them. While the numbers have changed somewhat, the fundamentals of the analysis are still sound. You can read a summary of the analysis here. I have been invited to speak at a National Day of Climate Action gathering in Rehoboth this Saturday, November 3, from noon to 2 p.m. at the intersection of Rehoboth Avenue and the boardwalk. This is one of many such events being staged around the country by an organization called StepItUp2007.org. The organizers in Delaware, led by Marc Weiss and Nancy Sedmak-Weiss, decided to focus on the prospect of bringing offshore wind power to Delaware.